Humor is a great way to reduce stress, but there is one type of humor you should avoid at all costs; sarcasm. If you were to look up the word sarcasm in the dictionary, you would see this definition: “To tear flesh!” That’s what sarcasm means. While a sarcastic comment may be funny, if the comment is directed at you, it hurts! Sarcasm is a latent (unconscious) form of anger. People use sarcams in an underhanded way to seek revenge. Many people who use sarcasm mask their anger with a quick barb and a laugh. Unlike other types of humor that reduce stress, sarcasm only promotes it. Sarcasm is rampant in the American culture, particularly at the worksite. Sarcasm can also be seen in the media as well. The comedian Rosanne is renowned for using sarcasm in her stand-up shows, even her TV show contained much sarcasm. She’s not alone in these efforts. The Dilbert cartoon strip is often called “Biting Humor.” Life, in turn, imitates art and sarcasm perpetuates throughout the culture. But this is not an index of a healthy culture, nor is sarcasm a healthy way to deal with stress. Consciously observe your thoughts and words this week for sarcasm. Ask yourself how often you use sarcasm. If and when you find sarcasm streaming from your lips, stop and ask yourself “What am I angry about?” Ultimatley, unresolved anger is a threat to your physical health. Unresolved anger must be resolved. When you hear other people being sarcastic, remind yourself that these people are angry. If possible, ask they why? (particularly if they include your spouse, friends or co-workers). I couldn’t find any worthwhile links on the topic of sarcasm, though there are many that flaunt it. Instead, I opted to include here an inspirational graduation speech by Steve Jobs at Stamford University. Enjoy! “He (or she) who seeks revenge should dig two graves.” —Anonymous. 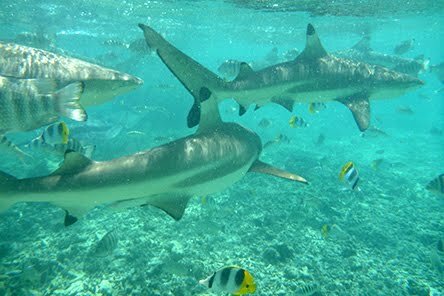 I didn’t plan on swimming with sharks while in Tahiti last month. They just kind of showed up. Thank God they didn’t like human flesh (as a rule, black tipped sharks never attack humans). But other sharks do! This seemed like an appropriate photo for today’s theme. Katy is a dear, lifelong friend of mine from my college days at the University of Maine (Orono). Every now and then we get together for a weekend visit. These weekends are always memorable, but one in particular (years ago) stands out. We were walking down a busy city street when Katy and I both spotted a homeless man pan-handling for change. Long before we arrived as his donation bucket, I had explained to Katy a previous experience when a beggar took my donation and headed right into the nearest liquor store—with glee. I was a bit stunned. “Once bitten, twice shy,” I said. Katy looked at me quizically, pulled out at few bucks from her purse, placed them in this man’s hand and smiled. As we continued to walk on, Katy explained to me that random acts of kindness are not necessarily done for the recipient. They are done also for the person doing the random act. “A gift is a gift, she said. “It’s not for you to determine how any gift should be acted upon. Its all about unconditional love. The purpose of random acts of kindness is to open two hearts, not one.” Katy was right! Any act of kindness opens two hearts. At a time when many hearts are closed by either fear or anger, consider the power (and freedom) of an open heart— Yours! No matter how bad off you may have it, there is always someone who has it worse. Consider doing a random act of kindness today, and often. Open your heart (and possibly your wallet or purse) to someone who is less fortunate than you. Given the economy, there is a large pool to choose from. Or consider going through your closet, selecting a nice piece of clothing you don’t wear as much these days and make a donation to Good Will or the Salvation Army this week. And the next time you see someone approach you begging for money or standing on a street corner with a sign move past any fear or judgement and open your heart, even if all you can give is a smile and direct eye contact. Respect to a fellow human being is also an act of kindness. 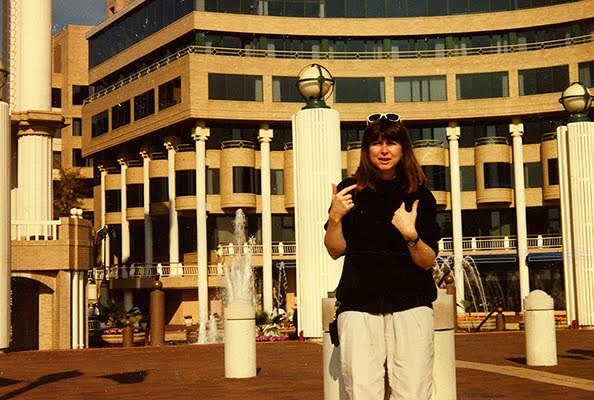 “Who Me?” Here is a photo of the one and only Katy, and I think this was taken on the day of the random act of kindness in D.C. Here’s to you, Katy! Thanks for being such a great sage! This weekend, in a small village about an hour north of New York City, a conference will take place that honors television, video and cinema and the people who use these media in an effort to offer hope for humanity and the world we live in. The conference is called, Images and Voices of Hope Summit (below is a link to their website). I first learned of this summit last summer when I received an email informing me that my documentary, Earth Songs: Mountains, Water and the Healing Power of Nature, was nominated as a contender for their annual award. The nomination is itself an honor, and as a first time film producer/director, I feel very privileged to be included in this group of acclaimed luminaries. Congratulations to all the nominees and a hearty thank you to all the people who have dedicated their lives in which to make the world a better place to live. Many people use cinema to change social norms, raise consciousness and influence people to make the world a better place in which to live. This was my purpose in making my movie, Earth Songs. This was the purpose of Al Gore’s movie, An Inconvenient Truth. Movies and the various media used to distribute cinema may be created to inform, educate and entertain, but when all is said and done, what moves people to change is being affected emotionally in a positive way. This, indeed, is what images and voices of hope is all about. When one considers media outlets like Fox News and talk radio hosts (who shall go nameless here) who use media to instill fear, it becomes a black eye on humanity. Many people say that there is nothing good on television anymore. While this may be true, there are many people using film (primarily documentaries) to share important messages and evoke emotions that raise consciousness in the hopes to make the world a better place. Please keep looking for these films. Please make an effort to listen to these voices. They do exist, and they are certainly worth watching, perhaps several times. 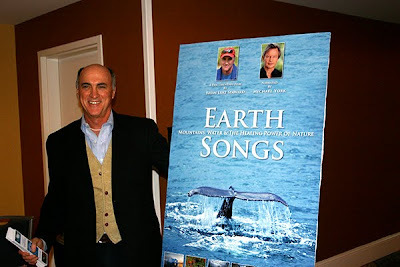 Earth Songs was screened in St. Louis a few weeks ago at the Healing Touch International Conference. It received a standing ovation. Thanks to all the people who have supported me an my efforts to share this film with the world. On a personal note, I would like to express my humble gratitude to renowned actor Michael York for his stunning narration, composer Brian Keane for his incredible musical score and all the people who were involved in the production of Earth Songs. A friend called me the other day and began the conversation with an apology. It caught me by surprise, perhaps because I couldn’t remember the incident in question. It didn’t take long to realize that whatever this was, it was weighing quite heavily on his mind and he felt it was time to make amends. Asking for forgiveness by way of an apology is not an easy thing to do, yet anyone on their death bead will tell you, it is something that really has to be done to achieve inner peace. Not everyone has the chance to have these death bed moments, which makes these times of resolution all the more important while we are quite alive. Making peace within ourselves, by making peace with others is an essential (but often neglected) part of the human journey. It is fear that blocks many people from seeking this level of peace with others, yet it is this same fear that needs to be resolved to achieve inner peace. Making amends is one of many ways to domesticate the ego, a stress management technique we all need to do on a regular basis. And… when we are on the receiving end of the apology, domesticating the ego is also in order, for holding grudges only perpetuates stress and that is no way to live a life of inner peace. 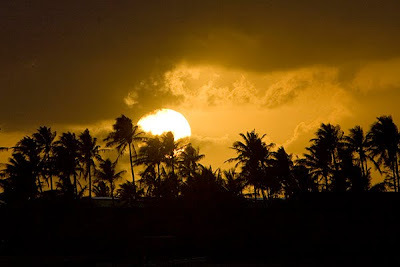 Is there someone whom you wish to make peace with, but have held back due to fear? As the expression goes, there is no time like the present to act. Making amends is one of the 12 steps in AA, as well as many other self-help programs (please see/read links below). Perhaps more importantly, making amends is one of the essential steps in seeking inner peace and enhancing one’s spiritual growth. Seeking forgiveness with others may result in some pleasant surprises. It many also produce few, if any results. But as we clear our conscience of our misdeeds (and learn from the experience), indeed, w make the world a better place. A sunrise photo of my last day in Bora Bora a few weeks ago. Enjoy! As we approach the fall equinox tomorrow, it’s a good time to stop and reflect on the concept of balance; specifically inner balance. Inner balance is a metaphor for homeostasis: that which unites mind, body and spirit in haromy—where the whole is always greater than the sum of the parts. In a stress-filled world where people are tugged at from all directions (family, career, social networking, etc.) it is quite easy to become unbalanced and lose our center of gravity. Imbalance will ultimately lead to serious health issues, if not corrected. The autumnal equinox, like the vernal equinox, serves as a conscious reminder to contemplate the significance of inner balance and what we need to do to return to and maintain a sense of center. For many people it means to decrease the excesses that cause a lilting of our being. For others it means pulling things into one’s life to regain a sense of balance. In truth, we are comprised of many scales of balance, from nutritional (energy) balance to our finances to the art of emotional balance. With light and darkness in balance tomorrow, nature serves as a wonderful teacher that reminds us to return to balance. Taoism, a philosophy of life is really a philosophy about living your life in balance. One expression from Lao Tzu, the father of the Taoist philosophy states: Stand like mountain, flow like water. The balance of nature, the balance of energy, the balance of finances. There is no shortage of books and references on the topic of balance. Here are a couple of websites, and to this I would add that Al Gore wrote a great book decades ago called EARTH in the Balance, which is every bit as important today as it was when he wrote it. 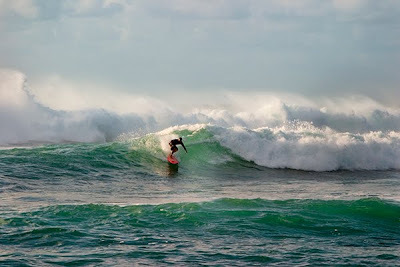 Surfing on the north shore of Oahu on the notorious pipeline is a challenge for only the best surfing dudes, and having tried my hand at surfing (but not there) I can tell you balance is definitely essential for this sport, as in life. Enjoy! Experts in the field of sociology are worried about the downward spiral of human civility. Their concern in not about the drug wars fought on the Mexican US borders or the Taliban problems in Afghanistan. No, they are concerned with human behavior across the American continent, from small towns to large cities. In general, people today are more rude, less tolerant, more cynical, less patient, more greedy, less friendly, more aggressive and less trusting of others. Simply stated, when people are stressed, they are not nice to be around. This, they say, does not bode well for culture as a whole. Some blame technology. Others blame bad parenting. Still others blame the media, specifically the talk shows where ranting is the norm. The bottom line is that as people become more self-centered and narcissistic, they become more clueless about the people around them, and while not acting out of malicious intent, it sure comes across this way. 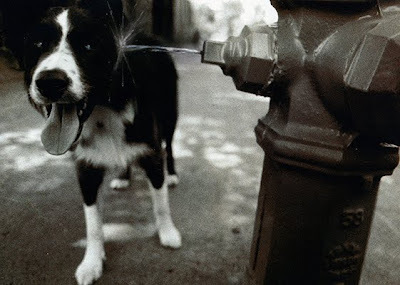 Civility is one attribute that separates us from the rest of the animal kingdom. Civility, and by association, chivalry, are rare commodities today. We are reverting back to our animal nature, and this is anything but good. It’s H.G. Wells worst nightmare on the island of Dr. Moreau. Make a vow today to join the ranks of the civil society, even if it seems like you are a minority of one. Without sacrificing yourself esteem, put other people first today. Smile at strangers. Open up doors for people walking right behind you. Allow other people to cut in front of you when waiting in lines. Don’t use your cell phone in public— at all! Strive to be aware (not oblibvious) and courtious of others. In general, just be nice to people. You might even be surprised at how one good turn deserves another. The karma of “As you sow, so shall you reap” is never far behind you. Open your heart to others, simply because it’s the right thing to do. Surprisingly, you may notice that in being nice to others, people act more civil to you too. The following is an interesting essay on civililty in America. 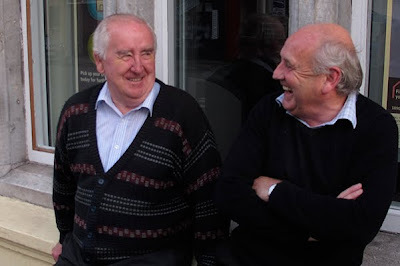 Photo of the Day: While in Ireland this summer, I stopped and chatted with some locals in County Cork. We had a great exchange of conversation and laughter. They commented about the youth of today being too tied to technology, oblivious to others around them;incivility. I told them it is the same in the US, and not just kids. Adults act this way too. Then we talked about music, some politics and good food. • Quote for the Day: “As citizens we have to be more thoughtful and more educated and more informed. I turn on the TV and I see these grown people screaming at each other, and I think, well, if we don’t get our civility back, we’re in trouble.” — Emmylou Harris, singer/songwriter. Slow Down: Join the Movement! Does it seem like the pace of life is speeding up? If you say “yes,” you are not alone. This appears not to be simply an American phenomenon, as people all over the world have noticed this fact. Several people have made initiatives to slow things down a bit, including the slow food movement (in opposition to the fast food movement) which began in Italy and quickly spread to France, and now the US. The slow food movement encourages people to cook their meals rather than order their meals through a drive-up window or microwave them in a plastic bag. This movement also encourages people to actually taste the food that enters their mouth and chew it, rather than inhale it, or consume the equivalent of a whole meal while standing at the fridge. Although the data isn’t in yet, speculation suggests that the number of speeding tickets is also on the rise (in case you were wondering, Police Departments across the country really do set quotas, as reported recently on the NPR show, This American Life. Given the shortfall of municipal tax base revenues due to foreclosures, the fines for speeding tickets have increased dramatically too!) The pace of life may be quickening, but you don’t have to add to the furry. Slow down! How many meals do you prepare from scratch in your home. How long does it take to consume a meal? Do you eat on the run (or standing at the fridge?) Do you travel the speed limit on local municipal roads? How many speeding tickets have you received in the past year? Do you literally find yourself out of breath racing from errand to errand? Do you suffer from heartburn (acid reflux)? This may be an indication that you are someone who inhales your food rather than chewing it. If you answered yes to any of these, there is a pretty good chance you are living your life in the fast lane, headed for burnout. Take some time to re-evaluate your life and see where it is that you can pull into the slow lane and stop to smell the roses. There are several books on the Slow Food Movement, including Marc David’s book, The Slow Down Diet. Here are some links that you might find of interest as well. 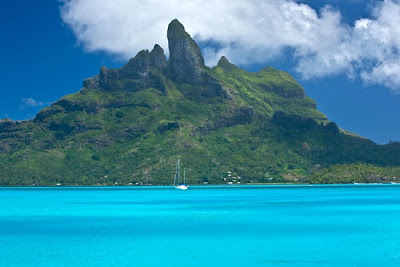 Photo of the Day: This photo was taken on a lazy morning stroll along the dock facing Mount Otemanu on the island of Bora Bora, Tahiti. Enjoy! The banana is the most commonly consumed fruit in the US and even then we don’t eat all that many. By and large, Americans don’t eat that much fruit all. When I taught nutrition at the University of Colorado, I would meet students each semester who confided in me that they NEVER ate any fruits or veggies. Without casting judgement, I felt sorry for their current and future health status. Fruits and veggies not only contain loads of vitamins, minerals and antioxidants, they also contain fiber. Fiber acts like a broom that cleans out the GI tract. It doesn’t take a genius to figure out that a lack of fiber in one’s diet can lead to many health problems (e.g., colon cancer is the third leading cause of death by cancer.) Having just returned from two weeks in Tahiti (Moorea, Huahine and Bora Bora) fresh fruit not only compliments each meal, sometimes it was the entire meal. Not a bad idea, particularly when it tasted so good. How many servings of fruits have you had today? Ideally, fruits should be included in each meal. Make it a point to include some type of fruit serving in each meal (and snacks). Nutritionists and health experts suggest to each locally grown produce whenever possible, and organic whenever possible as well. They also suggest to eat a healthy variety of fruit (not just bananas). One suggestion is to consume every color of the rainbow each day. Not only does this provide a variety of bioflavinoids (which help prevent cancer), a rainbow diet adds to the health and vitality to each chakra and its associated color, from the root chakra (red) to the crown chakra (purple). Consider making a list of the seven colors of the rainbow and next to each color, list five fruits and veggies of that color. Use this as your next grocery list. This website calculates the amount of fruits and veggies you should have per day when you enter in your age, gender and physical activity level. The next web link provides more info that we should all know about fruits and veggies. As part of a morning boat ride around the Bora Bora lagoon, Will, our captain pulled up anchor at a small island, smiled and said it was time to eat. 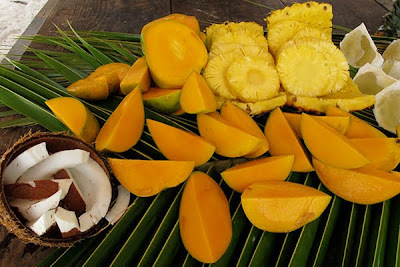 He then proceeded to prepare an array of freshly picked fruit that would (and should) make any mouth water. Tahiti never tasted so good. This is what the spread looked like before it disappeared. Enjoy! Take time to be part of your own geographic jokes. Be there… for your sense of humor. To do this you have to step outside yourself and look around at the world you live in. Look for incongruencies. Then smile. Work your funny bone. The word humor means moisture of fluid. It’s a great reminder to go with the flow. So find something ironic to laugh at today. Just back from vacation I didn’t have time to check out a good link, but this was waiting for me in an email. Enjoy! (and apologies up front to the people from Nashville). These are Nashville , TN.’s REAL 911 Calls!